My favorite Bond villain has passed away at age 74. Richard Kiel was one of the few recurring villains for the vaulted franchise, playing the monster/henchman Jaws for two films. Considering his massive frame, he topped out at 7' 2", 74 years of age is pretty robust. Andre the Giant only made it to 46. These big guys aren't built to last and it makes me sad. 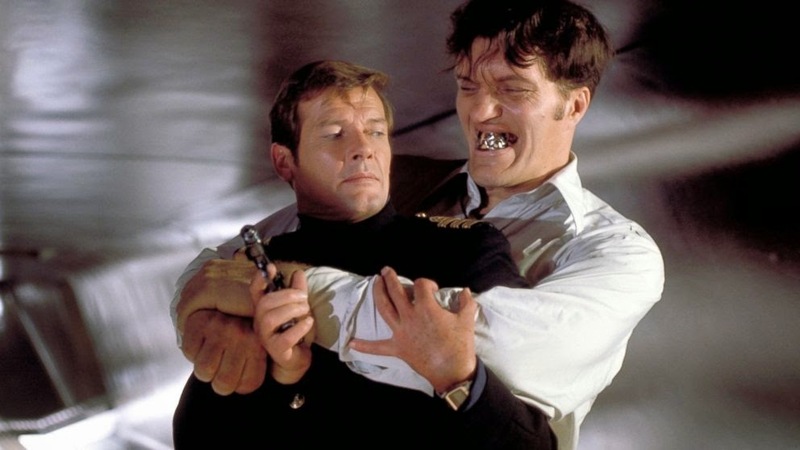 In The Spy Who Loved Me and its follow-up, Moonraker, Kiel played menacing Jaws, the giant with the metal teeth, capable of killing you with his bare hands by strangulation or biting your neck like a vampire. I'm serious. He did that a couple of times. Playing opposite Roger Moore's Bond, Jaws was completely frightening. Moore was a big guy during his peak, around 6' 1", but looked tiny compared to Kiel. YouTube some of their fights, Moore looks like a baby compared to him. Richard Kiel also played a great part in Happy Gilmore. He played Mr. Larson, freakish boss to Adam Sandler's golf maniac Gilmore. In addition to this, he played a bad guy in Silver Streak, starring Richard Pryor and Gene Wilder. Kiel was scary in that part too, but always struck me as a sweet guy during interviews. It's always that way; the big guys look scary but are softies underneath. Some Bond fans take issue with Jaws switching sides at the end of Moonraker and becoming a "good guy," but I think it's great. It's a complete character arc, from shallow, one dimensional thug to someone that understands when he is being used and decides to step up and do the right thing. I'll also remember Kiel as the giant alien in one of the best Twilight Zone episodes, To Serve Man. It's a great one. Any other favorite roles/memories for this unique actor? Sound off below.